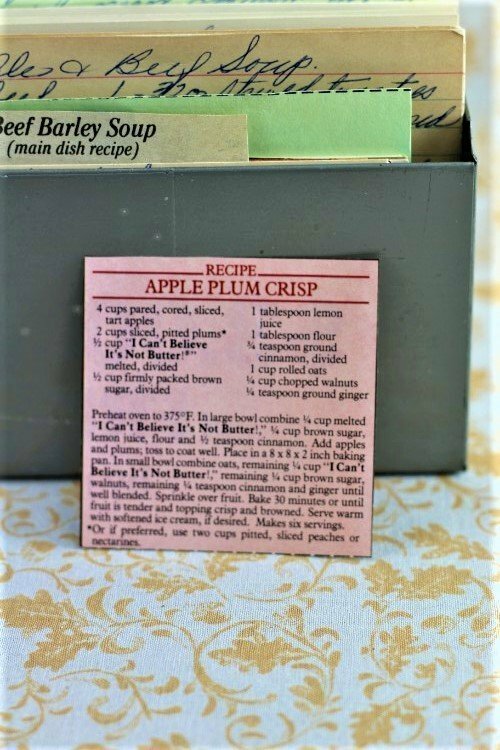 Front of the recipe card for Apple Plum Crisp. There are lots of fun recipes to read in the box this recipe for Apple Plum Crisp was with. Use the links below to view other recipes similar to this Apple Plum Crisp recipe. If you make this Apple Plum Crisp recipe, please share your photos and comments below! *Or if preferred, use two cups pitted, sliced peaches or nectarines. 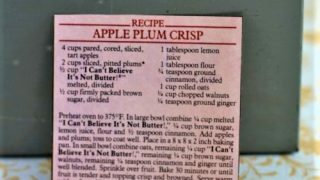 In large bowl combine ¼ cup melted "I Can't Believe It's Not Butter!," ¼ cup brown sugar, lemon juice, flour and ½ teaspoon cinnamon. Add apples and plums; toss to coat well. Place in a 8 x 8 x 2 inch baking pan. In small bowl combine oats, remaining ¼ cup "I Can't Believe It's Not Butter!," remaining ¼ cup brown sugar, walnuts, remaining ¼ teaspoon cinnamon and ginger until well blended. Bake 30 minutes or until fruit is tender and topping crisp and browned. Serve warm with softened ice cream, if desired.